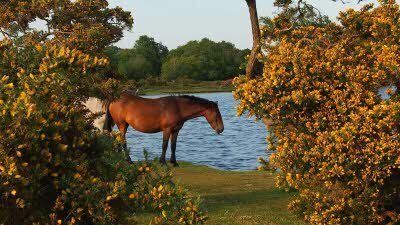 Two of the Caravan and Motorhome Club’s most popular touring sites are located in the picturesque New Forest. The 130-pitch newly redeveloped Black Knowl Site in Brockenhurst opens onto over 140 miles of forest walking tracks that can be explored on foot, cycle or horseback. Pitches for two people are available from £24.70 per night. Once the royal hunting forest of William the Conqueror and now a beautiful National Park, the Black Knowl (New Forest) Club Site has an open, peaceful aspect while being conveniently located within walking distance of Brockenhurst. The site is in a wonderful setting in the forest and in October at night, stags can be heard roaring in the forest, along with owls and other forest creatures. The town offers plenty of good quality restaurants, places of interest and shopping treats to keep everyone in the family happy on their holiday. Or try the 275-pitch Centenary Site near Bransgore which is set amidst beautiful rolling countryside and is home to the Club's celebratory Centenary Gardens and time capsule. Pitches for two people are available from £24.10 per night. Just three miles away from the pleasant village of Bransgore in the New Forest National Park, New Forest Centenary Club Site was originally part of a Second World War airfield. In fact, parts of the original runway still exist and there is also a memorial to the New Forest Airfields just to the north of the campsite, making this a very attractive destination for those interested in war history. There is also an excellent dog walk plus loads of fun play equipment and a safe play field for younger visitors. The campsite is a great base from which to explore the charming local landscapes by either foot or bike, with cycle routes starting as nearby as 200 yards. For a great day out visit the nearby National Motor Museum and its partner attractions at Beaulieu which make up one of the UK’s most popular visitor attractions. Club Members wanting to visit Beaulieu can take advantage of the Caravan and Motorhome Club’s exclusive one third off entrance offer for up to four people. This is just one of the many offers available to members as part of their annual membership fee. The National Motor Museum is also home to the Club’s exhibit which showcases both the history of the leisure vehicle industry and the Club. The colourful booth boasts interactive elements and videos, enabling visitors of all ages to find out more about the past, present and future of the Club and the industry. Harvey Alexander, director of marketing at the Caravan and Motorhome Club said, “Our touring sites in the New Forest are fantastic bases for holidays, there is so much to see and do in the area. Touring holidays are hugely popular; the Club saw a 17% year-on-year increase over the May bank holiday, the August bank holiday produced record bookings for the Club and it has been the best year ever for off-peak bookings. The bookings figures come as no surprise given the choice of amazing locations on our site network and unbeatable money-saving member offers. Contact our press team - they're happy to help with any media enquiries. Champions of the great outdoors, the Caravan and Motorhome Club represents the interests of over one million caravanners, motorhomers and trailer tent owners across the UK. Founded in 1907, the Caravan and Motorhome Club has 111 years’ experience and prides itself on offering great value and high quality sites for caravanners and motorhomers. Caravan and Motorhome Club membership is just £52 per year and provides members with access to 2700 quality sites in the UK and overseas. The Club also offers a choice of 300 sites across Europe including France, Spain and Germany amongst other destinations. All members can take advantage of expert advice, overseas travel services, cover and insurance and exclusive member offers and discounts. For further information about becoming a member of the Caravan and Motorhome Club please visit www.camc.com or call 01342 318 813.